Recently we have been blessed with amazing weather which has in turn allowed Maxwell and I to spend a lot of time outdoors. As a family we love spending time outdoors and every week we try and visit somewhere new in the New Forest. 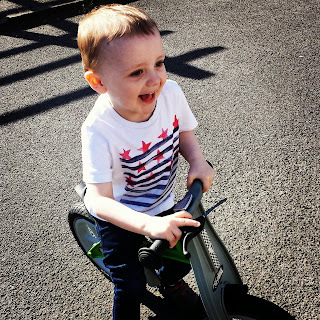 Recently Maxwell was given the opportunity to review a new bike. Being a outdoor lover Maxwell happily accepted his invite to review the bike. Maxwell was sent a FirstBIKE to review. 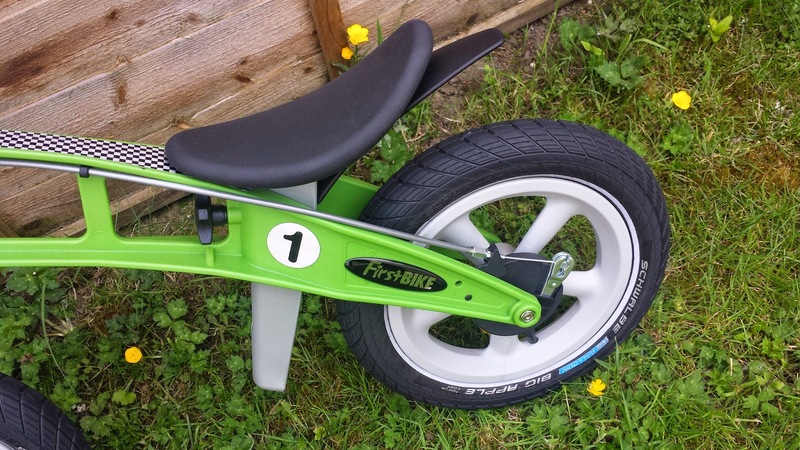 FirstBIKE is a new balance bike designed for children aged 2 to 5. The bike comes in 5 different designs and is available in 9 colours. The styles of the bike can be chosen by you, the styles vary on where you will be riding the bike. Maxwell was sent a racing FirstBIKE. 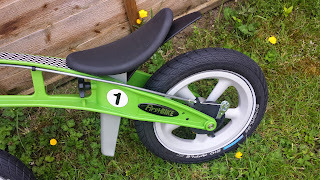 The racing bike is perfect for children who tend to ride on any type of surface. 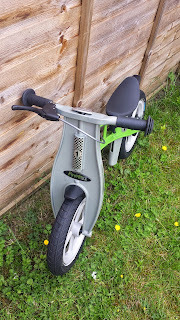 This bike fits perfectly with our needs due to the fact we have a grassed back garden but we have a concrete front which Maxwell often enjoys playing on. We also live in a area which is full of paths but also grass fields so the racing bike was a good choice for us. When the bike arrived, it came in a neat little box. The instructions inside the box were easy to follow and the bike took us around 15 mins to put together. There were a limited amount of pieces of bike to fit together and a limited amount of tools were needed to set the bike up. 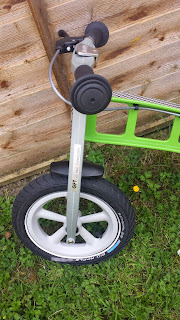 After we had put the bike together we were able to add stickers to the bike which made the bike look more decorative.We were sent the bike in the colour green which is bright, fun and perfect for a bubbly 3 year old. The stickers which came to decorate the bike were racing themed, the green colour and the racing themed stickers complemented each other. Maxwell wanted to go on the bike straight away and we were happy to allow him to go for a bike ride in our local area. Maxwell got on the bike however we found that the seat was a little to all for Maxwell so we had to adjust the seat. The seat was easy to adjust and as soon as we had adjusted the seat Maxwell was able to go on his way. 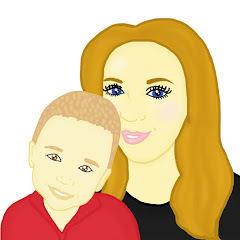 Often I can be a parent who panics about their child's safety. When Maxwell is out and about on his bike, my panics about his safety heighten however the FirstBIKE has many features that allow me to know that Maxwell will be safe as he plays. 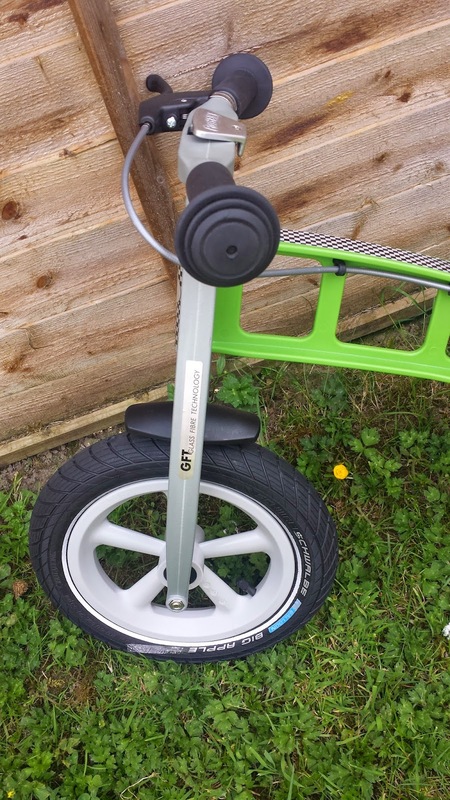 The bikes features a SafetyStop brake with provides gradual breaking and a steering limiter to help control the bike and prevent falls. The ‘horse saddle’ seat prevents slipping whilst riding and the bike promotes itself on the fact it has no sharp edges or protruding screws. Often Maxwell can get tired when out and about on his bike and he sometimes needs me to either carry his bike home or I push him home on his bike. Often bike's for children can be quite heavy however the FirstBike is a light bike weighing in at just 3.9kg. We have had the FirstBIKE for just over a month and so far we are very pleased with the bike. As a parent I would say the bike is fantastic quality and each feature that the bike has has been thought out carefully, these features have led to the bike being well designed and making the bike a good quality bike. We have been to the park on the bike, we have taken the bike to other family members houses and we have taken the bike to local country parks with us. Each time the bike has been in use, it has been ridden easily and Maxwell has grown very confident on it. All FirstBIKE's come with a lifetime warranty on the frame and fork and a 5 year warranty on all other parts. Extra items are available to buy such as baskets, bells and hi vis jackets which can make nice little extras when purchasing this bike. The green racing bike which we were sent can be purchased here for £109.99 which I think is a reasonable price. This is fantastic. I am a fully converted balance bike fan after my son loved his from the age of 3-5, then for his 5th birthday got a "proper" bike. He literally got on it and rode it, we couldn't believe it. He's so confident and fast, and I put it all down to the balance bike.